Discussion in 'General Discussion' started by MikeOW, Apr 13, 2016. I'm new here and I am wondering if your community can provide me with feedback regarding some new options trading software my company has developed. Over the past few weeks I've been trying to get feedback from individual options traders regarding our software, but now I think it's time to ask the wider community for their commentary. Many of them recommended that I come here, to CapitalDiscussions to try and get feedback and, well, here I am. If you have any feedback or questions, either PM me or reply and I'll do my best to help you all. Welcome to CD. Your software looks very interesting. But realized I don't have any of the data sources your software is integrated with. Many of the traders in this community uses thinkorswim. Would you consider including TOS as a data source? Welcome! Do you have any demos videos besides connecting data sources and the interface video that shows how to manipulate the windows? I have looked at your YouTube videos and also your online documentation. It is a lot of information in the documentation, so clearly my comments are just first impressions. First of all it looks like your software need a data source and IB is only one which may work for some on this forum. Most use TOS. 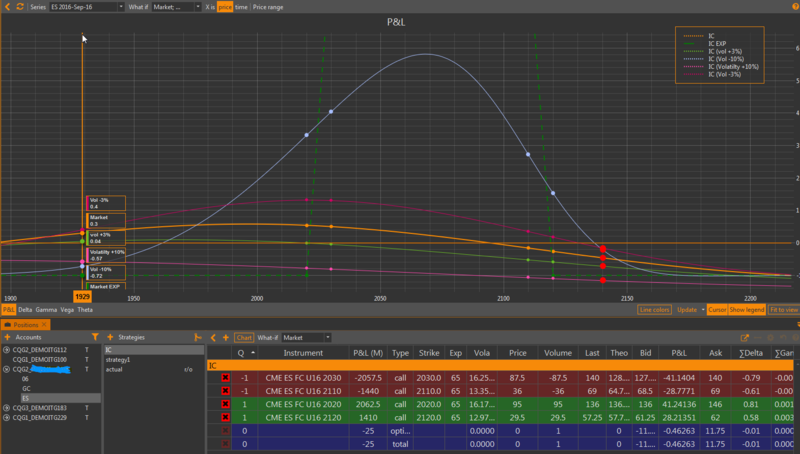 1. keep track of PnL of EACH trade/set-up, including ongoing adjustment. In TOS and I think all other broker platform do not do a good job of keeping track of individual setups. 2. Monitor their trades, specifically T+0 lines and the Greeks. Reliable modeling and projections of T+0 is the foundation for most strategies used and discussed on this website. 4. Back-test strategies in the same manner as they would be traded: trade by trade, option cycle by option cycle. 5. This is not a "frequent traders" forum, adjustments are usually done on daily basis. May be on hourly for some weeklys options trader. 6. Report and analyze results, including replaying trades step by step. Thus for me (and I think many on this website) it would interesting to see how this software compares to the two most popular modeling tools OptionVue and Optionnetexplorer. Each one has its strengths and weaknesses, but both can support the style of trading I have outlined. I would be happy to talk to you if you want more feedback. First of all, thanks for bringing this up. Our users have ask us this questions quite often. At the moment we aren't able to connect to the ToS network. However, I'm in communication with them at the moment, and I'll be sure to update you all if/when the situation changes. We are aiming to release roughly one or two videos every week. At the moment we are focusing on product development (There will be a new version released in the next few days). Soon we'll have a larger collection. If there's any specific subject you think we should make a video on, be sure to ask me here or PM me. P.S: Great job on the website! Thanks for the comment. With regards to the documentation, at the moment I'm in the middle of editing it to make it a bit more readable, as it comes off quite technical. With regards to your points, ill try to respond as best I can. 1. Yes, we've had a lot of feedback regarding the shortcomings of other software when it comes to tracking PnL. I've explained this to the lead developer and he believes we can resolve this problem without too much effort. 2,3 & 6 I think our software is able to do this. Also, if there are any changes needed, we'll be able to do it without too much trouble, I believe. 4 - At the moment, this is still a large challenge for us. The primary reason is that we don't have any market data back end. We are going to investigate similar functionality in other products and then make an estimation as to when we can include it in OW. If any of you guys have any suggestions as to how to implement it, we'd appreciate it. I downloaded the trial version of software but at this point is quite useless. Was this supposed to be a working software or just a work in progress ? Regarding 4) ivolatility, Esignal or IQfeed offer historical data for option contracts. Is it possible to track ESTX50 options with IB TWS data connections in your software? Will there be an excel or database interface to be able to analyse historical options data? Status1, Thanks for giving it a try, I appreciate it. The software functions well, and the greeks always appear for me. Is your data feed (at the bottom left of the screen) indicating an active connection? (it should be green, not red) Anyhow, I recommend you send a ticket to our support department. You can send it by clicking on the envelope icon in the top right of the software. If you have any more issues, you can post in this thread, PM or email me and ill try to help! At the moment we don't have that particular option on our system. I believe it comes from the Eurex exchange, which is a major exchange, so I can't see there being much problem adding it into the software. We would need to find out how to parse the data before we can add it, though this isn't a major task. As for using excel, we are able to export data from our software into excel. Regarding back testing functionality, we haven't implemented it yet, and it will be a while before we do, because it's quite a challenge to program. In the future, we do intend to tackle this issue, but at the moment we are looking to improve our software's current functionality. Ok, no problem - I've PMed you! It's been almost a week now, so I'd like to thank you guys again for giving me the opportunity to speak here! Apologies for the sound quality, I've since bought a mic for any future talks! For those of you who saw this video and attended the presentation, how does OW stack up against OV and ONE - especially back-testing and IV modelling? I'm sorry it's been such a while since you asked this question and nobody replied. Because we're still quite new, not many people have had a chance to compare OW with 1Option or OV. With regards to Backtesting, we don't have that functionality at the moment, although you can export data to excel manually. Automatic back testing is something we'll consider in the future. As for IV modelling, there are 'what if' scenarios where you can change the volatility conditions to see how the options perform. These changes can be charted and modelled. I watched your video with great interest, as the community here (and in the broader options community) is always looking for new capabilities in our trading software. One of huge drawbacks in your software that I see is the backtesting. I know several others have said this, so I hope you don't take it lightly. I have used both OV and ONE, and that's my primary use. If I was only trying to model and track a trade I'd probably just use TOS since it's free. Backtesting is one of the primary benefits we get from the other software. I hope the feedback is helpful. I just wanted to give an additional perspective about the necessity of backtesting. While I know you don't have it right now, its soon inclusion would be a requirement for my needs. In other words, I would never be able to subscribe without that capability. I would not be able to justify payment for a tool that only supported live trading, even though I would like to have a better tool for live trading. This may make our community here unique compared to your other customers, but the backtesting is a crucial element of our approach, as you will see by perusing the forums that Tom has put together. So, I hope this adds another voice to motivate your product development team! What do you think about “forward” testing (I’m not sure that this is the appropriate term). I mean the approach, where we simulate the underlying price as customizable ‘random walk’, calculate the option’s price using some customizable models and give the user the ability to run a simulation session and manage the portfolio. This would be very similar to a trading simulator. Basically the approach is the same as for backtesting, but the source of price is different. I’m not comparing this to backtesting, I just wonder what you guys think. To be clear we are still thinking about implementing these features.